A guide on what to wear to your session, as well as tips for the best booking times! The number one question that I get asked by couples is: “What should I wear?” It’s not just couples. Every single session that I photograph, that’s what I get asked the most. I think it’s the one thing that we all stress over the most, because it’s the thing that we think people are going to notice the most. A good photographer will have the focus on you and your loved one, but obviously having a great outfit will definitely help in that matter! The best advice that I can give is: BE YOURSELF!! If you’re a jeans and t-shirt kind of girl, don’t kill yourself wearing heels and some extravagant dress. If you’re comfortable, or you don’t feel like yourself, it will show in the photos. You want your personalities to SHINE through! So please remember that when choosing an outfit, and I promise you’ll have amazing photos! Below, I give some tips and advice for different outfits. I hope it helps! We LOVE natural light because we feel that natural light from the sun and its reflections, creates photographs that feel fresh, timeless and true to you as a couple. We begin all engagement sessions 90 minutes before the scheduled sunset during “the golden hour,” when the light is the dreamiest. Use a sunset calculator online to determine the scheduled sunset for the date and location you’d like to do your session. Then, just subtract 90 minutes to figure out your start time. 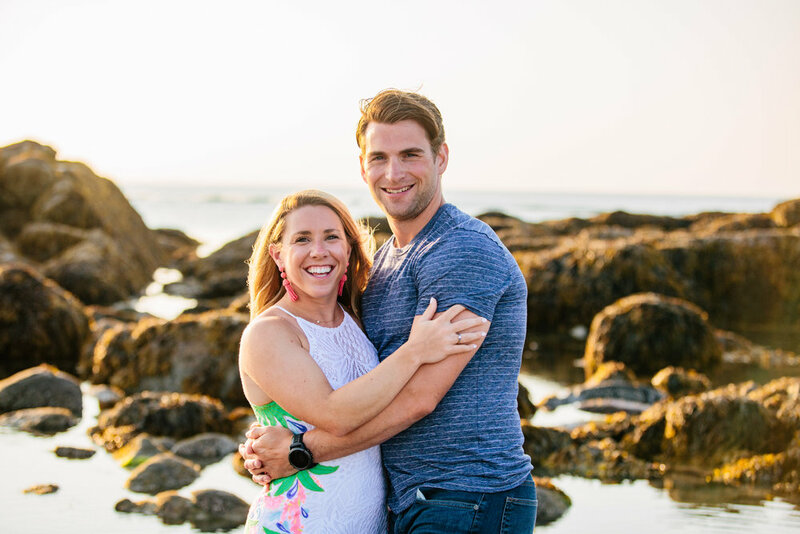 Remember, the sun sets much earlier during the colder months of the year and much later during the warmer months, so make sure to factor that in when choosing your engagement session date, especially if you’re taking time off work or have evening plans afterward. To get the most out of your session, please plan a buffer when getting ready so you can arrive a few minutes early. If you’re wearing two outfits, save your favorite one for the second half, and if you’re wearing only one, arrive in that. 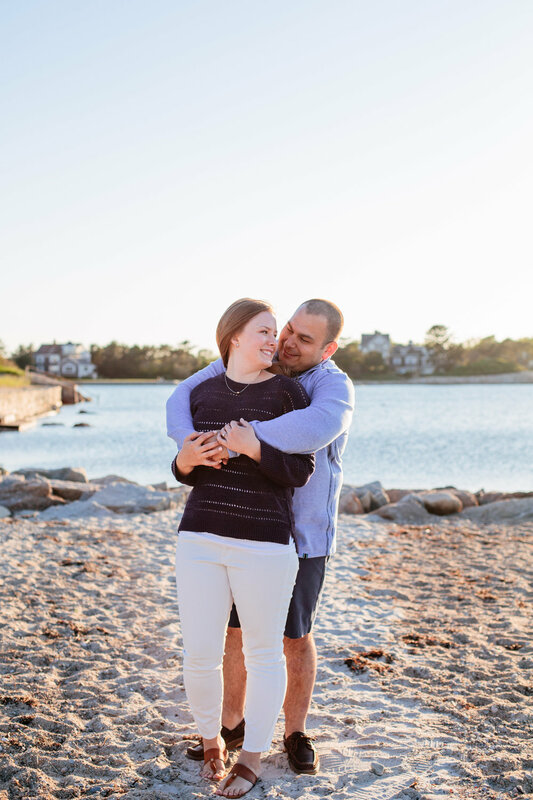 THE LOCATION OF YOUR ENGAGEMENT SESSION IS UP TO YOU! If you have a specific location in mind already, let us know. If not, we can always suggest a location. We are constantly scouting and searching for new locations to use. The location of your session should be some reflection of you. If you don't like the beach, then we obviously won't go there. If you never go downtown, then we'll avoid that. This all comes back to us getting to know each other more so we can settle on a location that fits you as a couple. THINK OUTSIDE THE BOX: Is there a place you like to go to on date nights? Sometimes this can be the best location! If its a business we can always try and get permission to shoot inside. Favorite Coffee shop or Brewery? Or maybe you like to grab Donuts at PVDonuts in Providence? We encourage you to brainstorm unique locations that you might have special access to that most people don’t. For example, maybe you, or someone in your personal or professional network, can secure permission to a location that would otherwise be off-limits, like a beautiful private estate, country club or resort. Maybe it’s a family ranch, upscale hotel or even an airplane hangar. The sky is literally the limit! NATURE: If we've settled on a location out in nature (i.e. woods, river, beach, etc. ), be sure to come prepared for that specific location. If we're heading out in the woods, be sure to bring bug spray and even shoes you don't mind getting dirty. TRAVELING: We love to travel and are on the road quite a bit especially in New England! 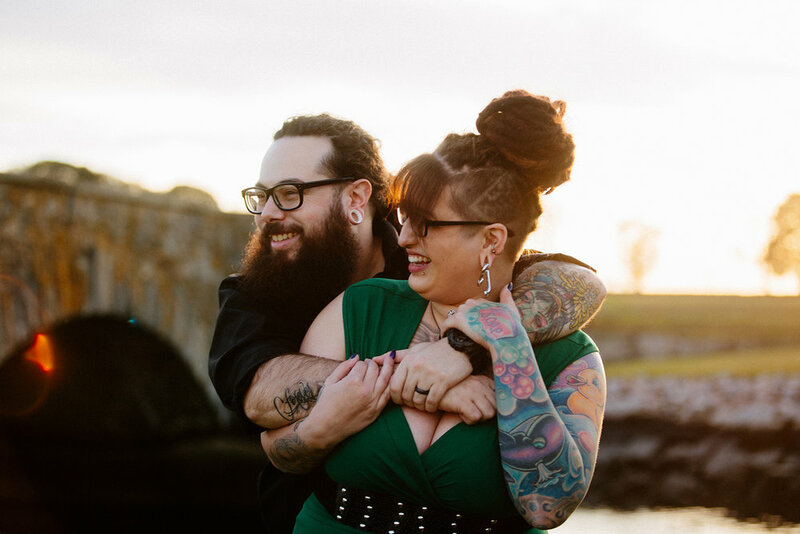 Destination engagement sessions are unique and fun! If you want to shoot somewhere that isn't local to Massachusetts, just let us know and we can discuss travel info. Keep in mind that travel fees will apply. We get a lot of questions from our couples about what they should wear on their wedding day. We'll do our best to answer all of those questions and more here. Have you thought about rocking a sequined gown, tulle skirt or flower crown but just never had an occasion for it? This is your chance to do it up! Remember: There is no such thing as “too dressed up” when it comes to your engagement session, so don’t be afraid to have some fun! If you don’t want to add a new permanent piece to your collection, a lot of my brides love Rent the Runway for their engagement photos because you don’t have to spend a lot to feel like a million bucks. Plus, you can send the outfits back when the session is over. Other brides just love having a great excuse to bring a new permanent piece (or two!) into their closet! Long flowy dresses and skirts look amazing on camera because they bring extra movement to the photos. Especially when juxtaposed with nature, like the forest or beach. Cute, shorter-length dresses photograph beautifully as well. Recently, I’ve seen more and more jumpsuits and midi rompers – they photograph really nice, too! In our experience, every woman, regardless of her shape has an area of her body that she’s self-conscious about, so recognizing what area that is in advance is key. Choosing flattering silhouettes and colors that complement your natural features is the best way to ensure you’ll love the way you look in your photos. Three-quarter length sleeves create an awesome slimming effect on all arms, so be on the lookout for an option with a longer length sleeve. You could also bring a cute jacket, blazer or cardigan along, too. Skinny straps or strapless dresses have the opposite effect on arms on camera, so we recommend avoiding those whenever possible if your self-conscious about your arms. Heels elongate women's legs making them look fabulous. Closed- toes heels in particular look great on camera because they carry out the line of your leg all the way down to your toe. If your toes are showing in a peep-toe heel, you might want to schedule a pedicure before your session so you don’t regret letting your feet show. These little tricks make all the difference! Quick Tip: Bring a pair of flats to wear when moving from place to place. Your feet will thank you later! GO PRO! Professional hair & makeup is on the top of most of our brides’ checklists because it looks amazing and removes the stress of getting ready on your own. From lash extensions to blown-out hair, professional hair and makeup will give you an extra boost of confidence in front of the camera, and it always photographs like a dream. You could even schedule your wedding trial the day of your session so you can get a practice run with them for the wedding day, plus you will be able to see what it looks like on camera! If you need a recommendation for hair and makeup, we work with the best in the business and have a great go-to team! They’re sweet as pie, talented as heck, unbelievable professionals and wonderful people. You’ll LOVE them! Just let us know and we’ll send you their information. We know they’ll take good care of you! There are a lot of elements that go into creating a beautiful photograph. One of those is confidence. Be sure you've tried on your outfits multiple times and seem them both together so you know you're going to look great. What you choose to wear has to be comfortable! You don't want to be fidgeting the entire session so be sure to wear something you can move around in and lastly, something that makes you feel awesome! From James Bond to Don Draper, Men look most striking in a well-tailored suit. The best part? If you don't own one, there are now amazing rentals companies where you can affordable rent a dapper look. Check out TheBlackTux.com, its our favorite! Solid shades of gray or navy are a strong compliment to most women’s outfits, whereas pinstripes or plaid patterns tend to distract the eye. If you feel like a suit doesn't suit you, pun intended :) Aim for long pants and a nice button down. Long pants and closed-toed shoes are the most sophisticated and masculine looks for men. They draw attention away from his legs and feet and place it where you want it: on the face you fell in love with. So, for your session, it’s best to leave the shorts and sandals at home. Think details! Ties, bowties, cool socks, belts, tie clips, suspenders, vests and watches are sharp compliments to any outfit. You can still mix and match accessories to compliment both of her dresses without doing a full change during the session. So, either way, you win. A FRESH HAIR CUT IS A MUST! Quick Tip: Be sure to eat before your session. Beyond that, consider grabbing a drink beforehand. A beer or your favorite cocktail might be exactly what you need to calm any nerves. If you're up for it, we'd love to join you for that drink too! Most men aren't overly excited to take photos for 90 minutes, because they don’t have an expectation of what’s to come and why it’s so important to you. Take fifteen minutes to educate and empower your guy. Tell him why you chose us and our style of photography. Show him a favorite session that we’ve done, explain why you love them and express to him how much it means to you. Trust us, once he knows it’s important, he’ll light up the camera for you! The most common thing we hear from guys before engagement sessions is this: because of a bad experience in the past, they don’t like taking photos or don’t think they’ll be good at it. By the time we’re done, though, they can’t believe how fast it went and just how much fun they had! Speaking of models, we definitely don’t expect you to go all “America’s Next Top Model” on us. We just want you to be yourselves. We will put you in positions and poses that feel natural and help create authentic moments. With that being said, if we ever pose you in a way that feels completely uncomfortable or you think feels unflattering, please speak up! We’re all about the experience and don’t want you looking back on your images and remembering how uncomfortable a pose felt. Throughout the session, we may take a few minutes to pause, drink some water, relax and chat. We are not going to just shoot constantly for 90 minutes straight. We want to get to know you and we want you to get to know us. We want to know what makes you laugh, what you like to do for fun and what you love about each other. Feel free to ask us questions too. The more comfortable we are with each other, the better your pictures will be and, most importantly, we won't be strangers showing up with cameras on your wedding day. TURN AROUND TIME: The turn around time for us to deliver your engagement session is 2-3 weeks. SAVE THE DATES: These should usually be sent out around 8-9 months prior to your wedding. GUEST BOOKS: If you aren't planning on using your engagement session images for your Save The Date or Invitation, but would like to use them at your wedding (for example, as a guest book), add at least a month from delivery to be able to design, revise and order your book. WEATHER: Sessions are generally rescheduled if there is a 80% or more chance of rain on the day of session. Living in MA, we know that the weather can change minute to minute! We'll stay in touch leading up to your session and make this decision together the day leading up to and sometimes the day of. Don't forget to plan a dinner date! You’re already going to be all dressed up! Why not take advantage of it? We know the wedding planning process can feel all-consuming, so take some time after the session just for the two of you to relax and have some fun together. You deserve it! Just like your wedding, the more you plan and invest in your engagement session the smoother it will go and better it will be. Don't leave the details of your session to the last minute. This will only create stress and will take away from what it is supposed to be - FUN! Please don’t hesitate to reach out to us with any questions you have. We're here for you and want to create a session and experience that is perfect for you!